It’s off to the races once again with the Micomouse maze solving contest at the 2011 RoboGames. This is a picture of the winner, a bot called Min7 (main page) which was built by [Ng Beng Kiat]. Using four phototransistors and a flash sensor it managed to first map the contest maze, then speed run it in under four seconds. See both runs in videos after the break. He’s certainly got a leg up on the bots we saw last year. Min7 beats them both in time, and overall control during the speed run. 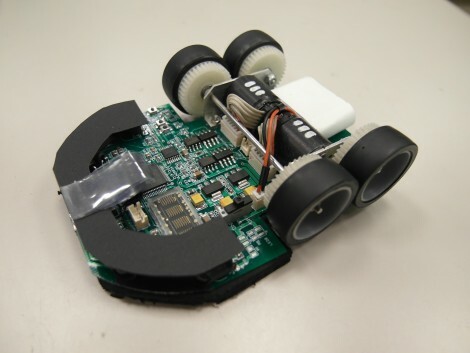 [Ng] mentions that this year is the first time he’s built a micromouse with four wheels instead of two. There’s a gyro on board which aids navigation by feeding the orientation data to the STM32 chip which controls the device. We took a moment to page through his past designs. It’s remarkable how they’ve evolved through the years. I just meant that Mike posted two of the same video instead of both videos he alluded to in his article. I do like seeing the training part, which allows the robot to record the map and calculate the solution. Fast little bugger, too! Thanks! it’s much more interesting to watch this video before the completion video since that’s the order the competition actually follows and shows how it suddenly -knows- the maze. else I would have assumed the path was pre-programmed and this would have been rather boring. Also awesome that while it’s in discover/mapping mode it still knows and uses areas it can accelerate to more rapidly. its just like jeroos, a basic java programming trainer thing we did in class. Did anyone spot the 4 character micro alphanumeric display? Jeez this thing is awexome! Heh, I totally missed that. Sweet! This is just amazing. I was an audience in one of these competition over 10 years ago. The reliability demonstrated by this micromouse is simply eye popping. BTW, without the training video, the 2nd video is simply incomplete. Thanks japkin. What is a flash sensor and how is it being used in this case? The schematic makes it seem that it is a photo-diode wired to a comparator, but that is just a guess. If you click on the Mouse History link on his page he writes about “modifying the mouse to prepare for flash photography” I suspect that sensor is supposed to detect camera flashes to filter them out of the sensor returns from the photo transistors. Never knew these had a training run… severely diminishes the accomplishment, IMO. I mean, why bother with the maze at this point? Just make an obstacle course. The second run is a speed run for accuracy and handling. You can see in the mapping it zig zaged through the long diagonal straightaways where in the speed test it flawlessly went straight on the diagonals. Im sure if you compared the second run of others you would see the importance. Coming up with a clever algorithm to find the shortest path and not get stuck in loops and what not doesn’t sound like maze-solving to you? It is amazing how this contest has evolved over the many years. What started out as a simple mechatronic task, evolved into a complex set of algorithms for finding a path, optimising the path, and has now turned into a battle for the lightest fastest and most powerful device you can build that maintains traction. I remember many years seeing a big difference in speed when contestant’s first started taking corners at 45deg instead of 90deg. Now everyone takes corners at 45deg and the battle is between those who have the best tread on their tires. One of my favourite machines a while back actually was bigger/heavier than the competition, but it was heavier because they used active suction to get more grip, the fan continuously pulling down so that the bot could corner at full speed.